Hi All! I am sorry I was gone for so long. I’ve been feeling a huge lull in inspiration lately! But, I am hoping that as of today the funk is over! Thanks to my new favorite blogger, Jillian Owens over at refashionista.net. Oh my goodness, this little lady is AMAZING! 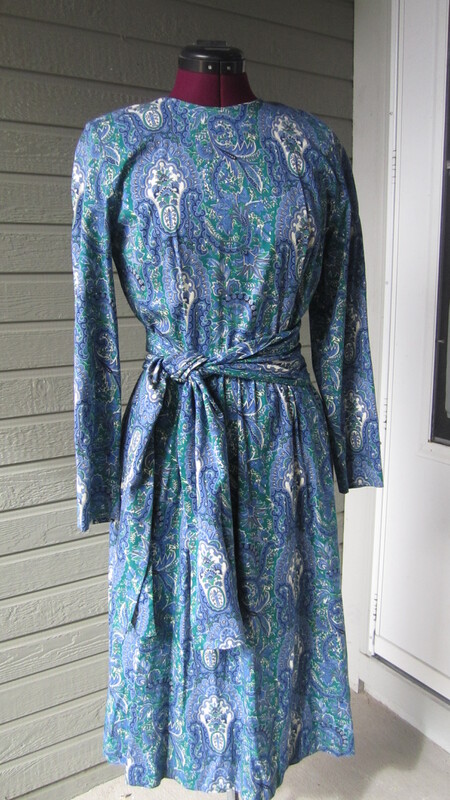 Every day for 366 days, she took a frumpy, ugly, thrift store find and made it into something new and fabulous! She finished her year, and decided to continue! She is now donating everything she makes to be re-sold and all profits will go to a women’s shelter! I am so impressed and inspired ; ) Be sure to check out her blog, and take a look at all of her creations! SO, Jillian gave me the spark to give it a shot, I picked up this frumpy thing at the Salvation Army for $3. I liked the print, and thought with minimal alterations it could be pretty. The trick is seeing the potential, right!? Certainly not model material, but CUTE dress! Even better with another recent thrift store find…Banana Republic linen jacket…YEAH! The dress has pockets! Awesome! LOVE IT and wore it all day! Love! Super job, Girl. And, yes, jargon is a word, used beautifully in your context. 😉 I miss you and appreciate the way you inspire me and so many. I need to be creative for my sanity too!